I happened to obtain a press pass to the 1996 MuchMusic Video Awards held at the ChumCity Building. I figured it would be a lovely opportunity to see all sorts of things City wouldn't want me to see. Casing the joint, I quickly noticed that security guards were stationed approximately every two feet, promising a challenge. But the staff, upon seeing my pass, seemed determined to spoil all my fun by letting me go anywhere I wanted on the main floor. Fortunately, security guards were making sure that only staff and artists were allowed upstairs and only technicians were allowed into the basement. Though there were a hell of a lot of security guards, they were unprofessional, and didn't know each other. They concentrated on their individual tasks rather than on security as a whole, and often didn't mind letting you past assuming you'd become the next guy's problem. Furthermore, their guard was down since almost everyone in attendance was drunk on the free booze. I found out early in the evening that if one held a clipboard and looked harried they'd assume you were on staff. If I'd had a headset, I think I could've gone anywhere in the building. I did the upstairs first. Waiting by the stairway until the guard was distracted, I gave off my best "I'm-in-a-hurry" body language and dashed up the stairs onto the 2nd floor without looking back. Once here, I found the abandoned offices of City, Much and Bravo employees. There was a beautiful photocopier too, but I had nothing to copy. Among their interesting stuff were shelves full of videocassettes of movies which they play on air, thousands of CDs that have been mailed to MuchMusic, and a lot of stationery, stickers and buttons. I contemplated filling my backpack with a few dozen CDs, but I figured one of the dozens of security guards would accost me eventually. It seemed all the employees had been brainwashed into devotion to the company. On a wall near the offices, I found an insane treatise that Moses Znaimer had had all the employees sign proclaiming that "Television has triumphed over the printed word" or some such nonsense. I also found a lovely little shrimp and salmon banquet table which had been set aside for the performers ... much superior to the Italian food they were serving downstairs. 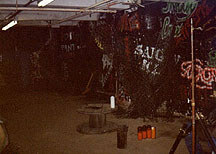 The well-graffitied basements underneath the station. After a far too brief exploration of 2, I checked out floors 3-6 but found them more or less dull; they were far too modern and well-locked up to be interesting. There were security cameras monitoring approximately half the floor space on each of these levels, but no-one came up to ask why I was the only person above level 2. The construction area on floor three was boring, and I couldn't puzzle out how to access the roof. Returning to the main level via the elevator (which had been programmed so that it would only go to the main level), I grabbed myself a clipboard so I'd look like an employee and skirted past security into the basement. From here, I found a way further down into a bizarre old cement subbasement, which had lots of odd props around and spraypainted graffiti all over the walls. Perhaps they used to film something down here. It was nice to see all the behind the scenes stuff of a building I've seen the public parts of so many times on TV. On the whole, I found there was far too much to look at in the brief period allotted (the awards downstairs were also quite interesting). I'd like to return again to see the rest, but I'll have to figure out another excuse to get inside first. This article originally appeared in Infiltration 1, together with a thorough infiltration of the Royal York Hotel.